Susan, I received the Bingo Cards yesterday. I absolutely love them! I will purchase more from you soon. Do you advertise to the schools? I think the math would be a wonderful addition to lower grade levels. This is a great game for young children (or the young at heart) who aren’t quite ready for spooky images. It’s filled with jack ‘o lanterns, trick or treaters, and other cute and cuddly images. There are lots of opportunities to compare and contrast images in this set. That’s a key skill that is developed in preschool and the early years of elementary school. Downloading the Trick or Treat Halloween Bingo Game as a printable? 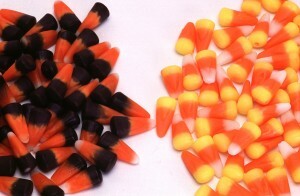 Use Either Color Candy Corn as Cover Tokens!